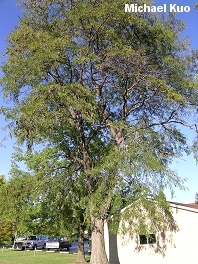 A tall tree with a spreading crown; leaflets tiny and numerous; trunk often with needle-like spines; fruit a 12-18 inch "bean" with many seeds; growing in the Midwest. 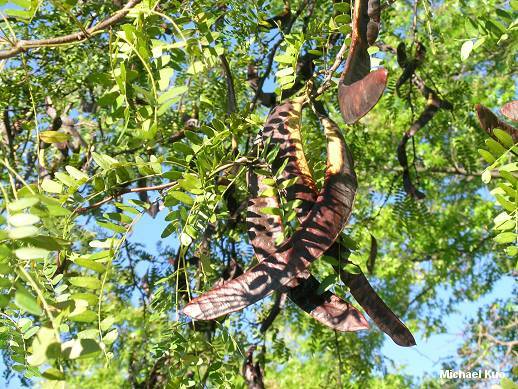 Habitat: Found in various forest types, though it prefers moist or sandy areas. Stature: 50-75 feet high; 2-3 feet in diameter; with an open, spreading crown. 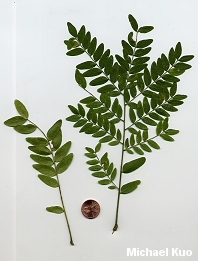 Leaves: Compound; leaflets thin, one-half to one inch long, flame-shaped; dark green above; yellow-green below. 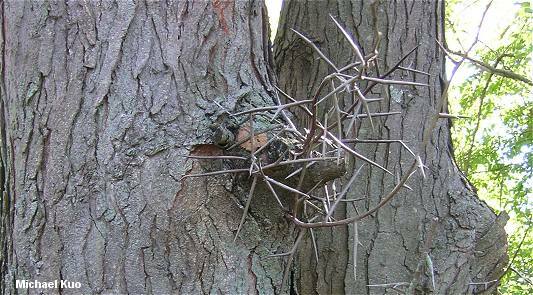 Bark: Smooth at first, developing vertical cracks that create a distinctive scaly appearance; gray. Fruit: A reddish brown "bean" 12-18 inches long. Ganoderma lucidum, Leucocoprinus flavescens, and others.